CINDERELLA: Arguably the most classic Disney Princess, Cinderella also gets a fairly classically-styled costume with a ruffled trim on her skirt inspired by Supergirl's most feminine uniform. For those of you wondering who Cinderella is, she's a minor supporting character from the 1950* movie that is named after her, despite mostly being about mice who like to make dresses. 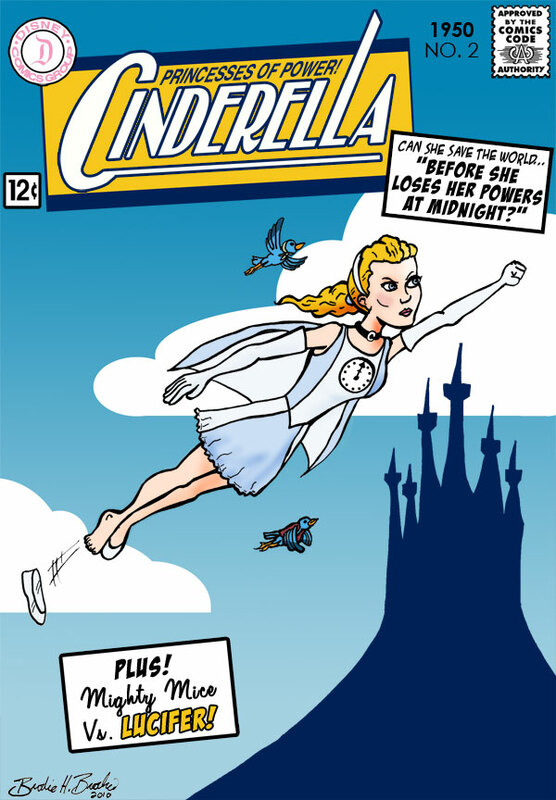 The clock icon on the chest serves as a reminder to Cinderella that her powers only last until the clock strikes twelve. No mask needed, since the glam makeover is enough to disguise her from the few people who know her anyway, but she'd better learn to keep a better eye on the footwear if she wants to keep her identity secret for good! *that's right, despite their modern reputation for being a princess factory, Disney actually waited 13 years between its first and second princess movie, and there are longer gaps to come. Uncle Walt wasn't big on repeating himself. If Disney had a hit as big as Snow White today, you know they'd have greenlit "Snow White II" AND "Dopey: Secret Origins" before the opening weekend grosses were finished being tallied. Tomorrow: The alluring Aurora: The Sleeping Beauty! OMG! The clock thing is genial! Love it!